Based on the most infamous scandal in gameshow history, Quiz re-examines the case of Charles Ingram, an army major who won a million pounds on gameshow Who wants to be a Millionaire?, only to be subsequently accused of an elaborate conspiracy involving his wife and another contestant on the show to cheat their way to the jackpot. Those with any passing familiarity with the hysterical media coverage of the ‘Coughing Major’ case may enter the theatre with a pretty clear view of both what happened and what kind of people notorious couple Charles and Diana Ingram really are. What James Graham’s production skilfully does is embrace and challenge those well-established opinions with equal passion, profoundly impacting surprised audiences in the process. Quiz leads audiences though the murky evolution of TV quiz shows, poking fun at the quirky theatrics and greedy consumerism and ruthlessness that underpins it. The productions use of video screens, Electronic keypads and frequent audience participation helps capture the peculiar quiz show world, whilst further investing audiences in proceedings by making them more explicitly involved and complicit. While seemingly silly it’s a fairly effective trick that pays off well during the shows more dramatic moments. Quiz boasts a versatile ensemble of actor that offers audiences a compelling mix of pageantry and pathos. Keir Charles is a flamboyant delight as an exaggerated but instantly recognisable version of Chris Tarrant. Helping paint a vivid portrait of the gameshow’s most public face. True praise belongs however to Stephanie Street and Gavin Spokes as the Ingrams, at the heart of the production their performances morph effortlessly as required between comedy and poignant tragedy. Leading man Gavin Spokes in particular does magnificent work at capturing the memorable eccentricities of Major Ingram whilst also managing to craft a vulnerable performance with sincere depth. Quiz goes well beyond mere impersonations in its quest for drama and truth. While the show’s second act bristles with anger and tragedy that is likely provokes plenty of audience self-reflection, it’s fair to say that the show’s first half is sometimes a little less focused as it has fun setting up the myths and misconceptions it later delights in tearing down. Frequent audience participation may be good natured fun, designed to set the scene for the gameshow drama, but at times it gives the show a pantomime like quality that belies some of the serious themes it truly explores. Likewise while the production offers audiences excellent arguments based on compelling facts, more stubborn spectators may not entirely welcome having their established preconceptions so directly challenged. Nobody like to feel wrong and changing minds is never easy. Quiz is a fascinating theatrical experience that provides audiences with frequent laughs and many lingering questions. It’s playful and interactive approach allows it to gently confront audiences with uncomfortable truths about what we believe and just how easily we can be deceived. 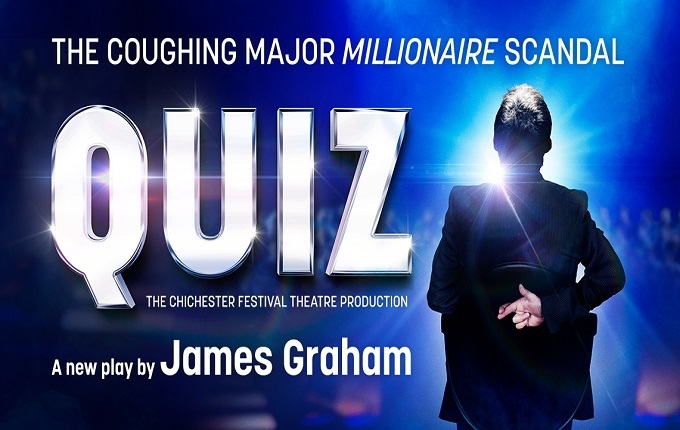 Quiz is a fun and thoughtful night out combining technology and mass media motifs with classic West End showmanship.